We are releasing the eBook on Tax Planning which tells you how to save income tax for FY 2018-19 (AY 2019-20) for both Salaried and Professionals. This is a short 43 slide power point presentation (in pdf) which covers all the tax saving sections and investments applicable for tax payers. But before that lets look at the changes that happened in Income Tax laws in Budget 2018. 7. 10% tax on long term capital gains (above Rs 1 Lakh) on stocks & equity based mutual funds. Also 10% dividend distribution tax imposed on dividend paid by equity mutual funds. 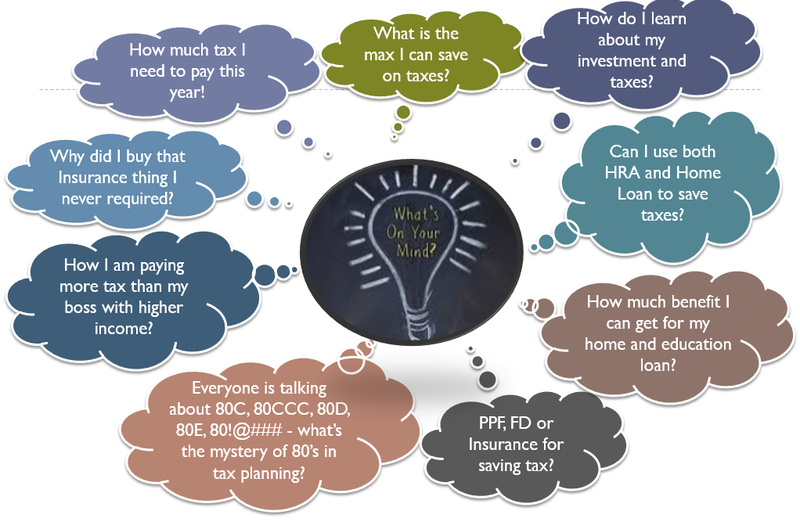 These 3 are the most popular sections for tax saving and have lot of options to save tax. The maximum exemption combining all the above sections is Rs 1.5 lakhs. 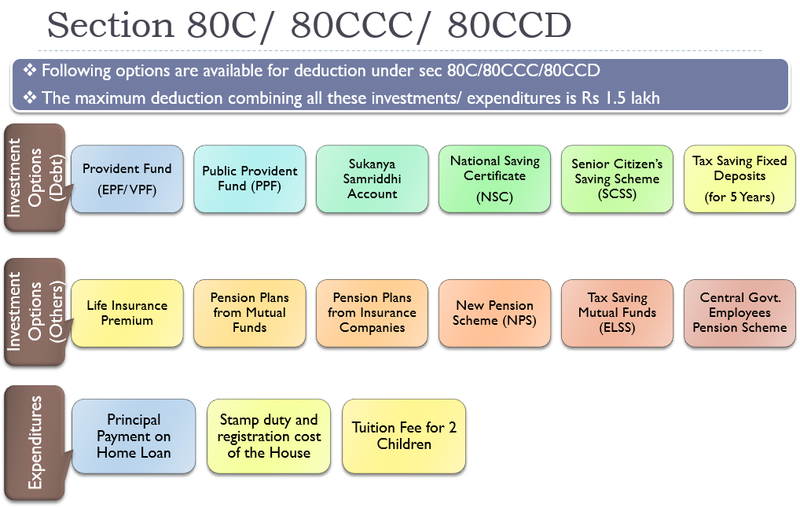 80CCC deals with the pension products while 80CCD includes Central Government Employee Pension Scheme. We have done a comprehensive analysis of all the above available options and you can choose which is the best for you. Know More: Which is the Best Tax Saving Investments for you u/s 80C? Budget 2015 has allowed additional exemption of Rs 50,000 for investment in NPS. This is continued this year too. We have done a complete analysis which you can read by clicking the link below. Invest or Not: Should you Invest Rs 50,000 in NPS to Save Tax u/s 80CCD (1B)? The interest paid up to Rs 2 lakhs on home loan for self-occupied or rented home is exempted u/s 24. Earlier there was NO limit on interest deduction on rented property. Budget 2017 has changed this and now the tax exemption limit for interest paid on home loan is Rs 2 lakhs, irrespective of it being self-occupied or rented. However for rented homes any loss in excess of Rs 2 lakhs can be carried forward for up to 7 years. The entire interest paid (without any upper limit) on education loan in a financial year is eligible for deduction u/s 80E. However there is no deduction on principal paid for the Education Loan. The loan should be for education of self, spouse or children only and should be taken for pursuing full time courses only. The loan has to be taken necessarily from approved charitable trust or a financial institution only. The deduction is applicable for the year you start paying your interest and seven more years immediately after the initial year. So in all you can claim education loan deduction for maximum eight years. Premium paid for Mediclaim/ Health Insurance for Self, Spouse, Children and Parents qualify for deduction u/s 80D. You can claim maximum deduction of Rs 25,000 in case you are below 60 years of age and Rs 50,000 above 60 years of age. An additional deduction of Rs 25,000 can be claimed for buying health insurance for your parents (Rs 50,000 in case of either parents being senior citizens). This deduction can be claimed irrespective of parents being dependent on you or not. However this benefit is not available for buying health insurance for in-laws. HUFs can also claim this deduction for premium paid for insuring the health of any member of the HUF. To avail deduction the premium should be paid in any mode other than cash. Budget 2013 had introduced deduction of Rs 5,000 (with in the Rs 25,000/30,000 limit) is also allowed for preventive health checkup for Self, Spouse, dependent Children and Parents. Its continued to this year too. Cost incurred for treatment of certain disease for self and dependents gets deduction for Income tax. For senior citizens the deduction amount is up to Rs 1,00,000; while for all others its Rs 40,000. Dependent can be parents, spouse, children or siblings. They should be wholly dependent on you. A certificate from neurologist or Civil Surgeon or Chief Medical Officer of Government Hospital would be required as proof for the ailment. In case you have dependent who is differently abled, you can claim deduction for expenses on his maintenance and medical treatment up to Rs 75,000 or actual expenditure incurred, whichever is lesser. The limit is Rs 1.25 Lakh for severe disability conditions i.e. 80% or more of the disabilities. Dependent can be parents, spouse, children or siblings. Also the dependent should not have claimed any deduction for self disability u/s 80DDB. To claim the tax benefit you would need disability certificate issued by state or central government medical board. You can also claim tax exemption on premiums paid for life insurance policy (in tax payers’ name) where the disabled person is the beneficiary. In case the disabled dependent expires before the tax payer, the policy amount is returned back and treated as income for the year and is fully taxable. Also Read:How to Pay 0 Income Tax on Rs 16 Lakh Salary? The government encourages us to donate to Charitable Organizations by providing tax deduction for the same u/s 80G. Some donations are exempted for 100% of the amount donated while for others its 50% of the donated amount. Also for most donations, the maximum exemption you can claim is limited to 10% of your gross annual income. Please note that only donations made in cash or cheque are eligible for deduction. Donations in kind like giving clothes, food, etc is not covered for tax exemption. How to Claim Sec 80G Deduction? Also Read: How you Loose Money in FD? In case, you do not receive HRA (House Rent Allowance) as a salary component, you can still claim house rent deduction u/s 80GG. Tax Payer may be either salaried/pensioner or self-employed. Along with the tax saving sections and investments for both salaried and business, it also has details about all the common salary components and their tax treatment. This section can help you to plan your salary components in case your company offers such facility. We hope that this eBook (in pdf/ppt format) would help you in understanding, planning and saving taxes. Please give us your feedback and help us improve! What is the Maximum Income Tax You can Save for FY 2016-17? You have described the most typical matter i.e. filing of ITR in a very descriptive way. 80C, 80CCD points are very nice. Every points are clearly described. Never found these info in a single article. Very Nice and resourceful article. Very informative. Thanks for sharing! Employer’s contribution to NPS on behalf of the employees exceeding 1.5 lacs is subject to Perks. The same contribution can be claimed as the deduction under Sec. 80 CCD? Confirm whether my understanding is correct? Thank you so much for sharing the best information on this topic. What are the top tax saving instruments? Thanks for sharing this useful information with us. I really like to read your blog. I have earned around Rs.5000/- by selling some scrips, thus short term capital gain. As per the recent taxation norms, the STCG is 15%. My tax bracket is 30%. Would you please clarify, whether I have to pay tax @15% or 30.4% on the short term capital gain. If it would have been long term capital gain, what will be the impact on tax. Hello Sir, I am a your loyal and regular website reader and finally thought of asking you a question. I am giving my portfolio below. I am 35 now and have a kid of 4 year old. My monthly income with spouse is 2 lakh. I have home loan of 50 lakh. Can you please review the information and help me if I can complete my goals. Appreciate if you give some suggestions. Thank you. I was to invest in the below two funds. I can invest 5,000 in each fund. So total 10,000/month. My goal is to generate 10 Lakh corpus in next 7 years. I am a new investor. Please help with the question. With SIP amount of Rs 10,000 per month generating a corpus of Rs 10 lakh in 7 years, you are expecting a return of 35% per annum. There are NO investment which can give this kind of return without taking huge risk. You have short term debt funds whose returns are similar to Fixed deposits! You need to reset the exception either in terms of final corpus, SIP amount or tenure of investment! Got it Sir. I agree with you. So if I can reduce the expected corpus and invest in these two funds then what is your opinion. I have low risk appetite and do not want to invest in equity. I want to invest 10K to make sure I have some corpus that will help me with my needs. Please check these funds below. Thank you so much sir again. Hi Amit, Thank you so much for sharing the best information on this topic. Very Excellent article and all points are indeed very well covered. Plz explain standard deduction in detail. Is it applicable for all or only for salaried/pensioners only? Can a house wife take its benefit? I need your help for some financial planning. Can you please check the below information and help. Thank you. Married and spouse income is 1,00,000/month. We do not have kids. Insurance – 1 Crore term plan. 1. Want to settle the house loan in next 5 years. Please let me know if we are on the right track.